While she was living her dream job, with a great husband and two teenage kids, another part of Tory’s life was an ongoing mess: she had struggled with her weight since childhood. In 2011, a conversation changed Tory’s life forever. Her TV boss told her she didn’t look her best and wanted to send her to a stylist. What Tory heard and took away was: “Lose weight or lose your job.” It was the best thing that could have happened to her. It was time to make The Shift. Tory realized that in order to lose the weight for good she had to make a radical—and permanent—shift in her thinking. She discovered that what she put in her head was far more powerful than what she put in her mouth. In one year, she lost 62 pounds and developed a healthier, happier lifestyle. 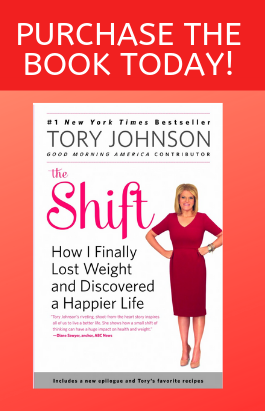 The Shift, published in 2013, was her answer to the thousands of women who asked, “Tory, how’d you do it?” It was an instant No. 1 New York Times bestseller that has helped thousands of women end the cycle of pain, discomfort and dissatisfaction that comes with being fat. While Tory openly shared her struggle of taking permanent steps toward a happier, healthier life, in the months after The Shift was published she discovered her work was not done. She had truly believed that she would live happily ever after — if only she could lose weight. But as her initial euphoria began to subside, Tory realized that other areas in her life also needed work. Buoyed by her successful weight loss, she applied principles she learned from Shifting to other areas with the same patient tenacity. In Shift for Good, available now — Tory delivers her remarkable results: how doors opened, relationships deepened, and opportunity abounded in every direction—all through taking small, simple, persistent actions. Tory’s practical and intimate new book—filled with specific tips and encouragement—will inspire readers to Shift every day, in every way.